I’ve been to Greece, and the yogurt there tastes nothing like the spongy flubber you get here. 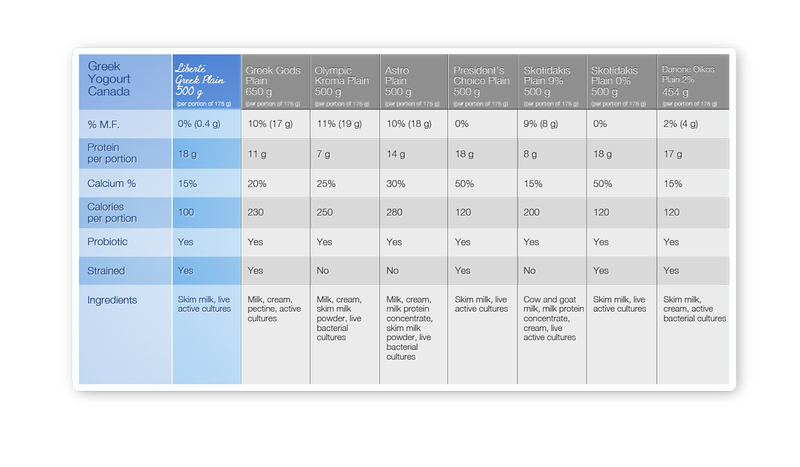 Aside from the taste and texture, I wanted to know: Is there a reason to choose “Greek” yogurt over regular? Is Greek yogurt natural? How can it be so much higher in protein than regular yogurt? And, like so many other foods (I’m thinking of things like smoothies and cookies “infused” with the latest superfood), have we taken the original and bastardized it to the point it’s no longer worth eating? I’m just look for a basic, healthy yogurt that’s pleasing to the taste buds…and so are others around me. But somehow yogurt (made originally from only milk and probiotic bacteria) has somehow gotten complicated. 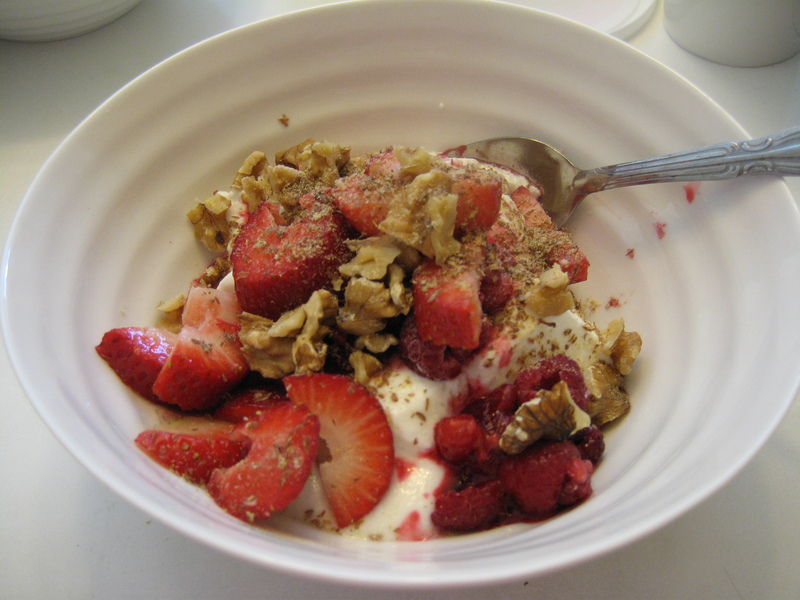 Take a look at articles like this one in Canadian Living that tells you how healthy a yogurt is for you boils down to three things: “fat, calories and protein. Look for non-fat varieties of Greek yogurt and check the nutritional label for low calories and high protein.” It also recommends choosing a yogurt with 18 grams of protein and no more than 100 to 120 calories. In my opinion, you shouldn’t have to know the chemical makeup of your food to eat well…sheesh! When I buy yogurt, I look at only the ingredients list because I believe you shouldn’t have to bring a calculator to the grocery store to figure out what to eat – when you eat real food, your body naturally gets what it needs in the right proportions. What I’m looking for is an ingredient list that looks something like this: milk, bacterial cultures. 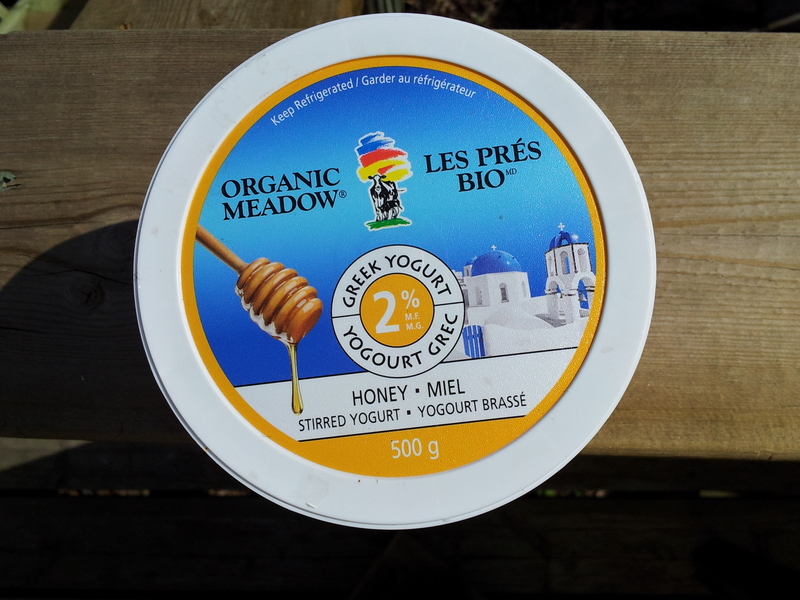 Below is a summary of some major Canadian yogurt brands’ Greek offerings. All of the ingredient information below is based on plain/unsweetened yogurt. Liberté 0% claims to strain their Greek yogurt according to the principles of old-time cheesecloth draining – basically removing water to concentrate the ingredients, which would explain the higher protein content. The ingredients in their 0% yogurt? Skim milk, live active cultures. Nice. Oikos (Danone) Plain 2% is “made using a separation method that allows us to use just three ingredients (milk, cream and an active culture) and three times more milk than a regular yogurt.” Ingredients: Skim milk, cream, active bacterial cultures. Checkmark. hnique.” The key word there is “inspired”; according to this Globe & Mail article, it sounds like the process may not be traditional at all. Unfortunately, there’s no way to tell for sure. Ingredients in the 2% Greek: Skim milk, cream, active bacterial culture, Vitamin D3. PC 9% Greek Yogurt Milk, cream, skim milk, bacterial culture. PC 2% Greek Yogurt Skim milk, cream, bacterial culture. Stonyfield Farms (Organic) 0% and 1.5% Ingredients: Cultured pasteurized organic low fat milk. Cultures: S. thermophilus, L. Bulgaricus, L. Acidophilus, bifidus, and L. Casei. I’m pleasantly surprised to see that the Greek yogurts on store shelves seem to be made from natural ingredients and aren’t artificially thickened. If you’re going to eat Greek yogurt, do peek at the label to make sure there isn’t extra milk protein concentrate or other weird strange additives – “Greek” isn’t a regulated term when it comes to yogurt, so manufacturers can slap that label on just about anything. Low-fat dairy products aren’t natural, and there is some evidence that skimming the fat from our dairy has led to problems. I stopped eating fat-free dairy after reading that low-fat dairy is linked to infertility. When yogurt is strained, the whey is lost, and it takes some calcium with it. Greek yogurt has about 33% less calcium than regular yogurt. Will I be making the switch? I’ve tried several brands of Greek yogurt, and I find them all unpalatable. Chalky. And oddly firm/jiggly. I’ll be sticking with my Astro Balkan Style and Liberté Méditérranée full-fat yogurts for now. Sweet on Greek yogurt? Here’s the skinny (Globe & Mail, September 2012): If you have a moment, read the comments. I’m so proud. These commenters give me hope that the “fat is bad” tide is turning. Nutrition Action Healthletter: Going Greek (July/August 2007). Contains note re: calcium lost in processing. Hi. I work for Canadian Cultured Cow Dairy and we product Tree Island Gourmet Yogurt. All our milk comes from one grass fed herd here on Vancouver Island. We’re only two years old but we can’t make enough yogurt, business is really taking off. We do sell at Whole Foods, Choices and a host of natural foods stores on Vancouver Island, from Campbell River to Victoria. Please check into our all natural yogurts, our 3 flavours of cream top and 5 flavours of Greek. I know you will be pleasantly surprised.